Ultimate Drummer’s Tool – Every drummer knows that drumsets need regular maintenance. Now, you can have all the tools you need in one with the Ultimate Drummer’s Tool! This multi-tool drum accessory has everything you need to fix issues on drumkits of all makes and models! It comes with a T-Handle drum key, multiple screwdrivers including a 5mm slotted, as well as #1 and #2 Phillips drivers. 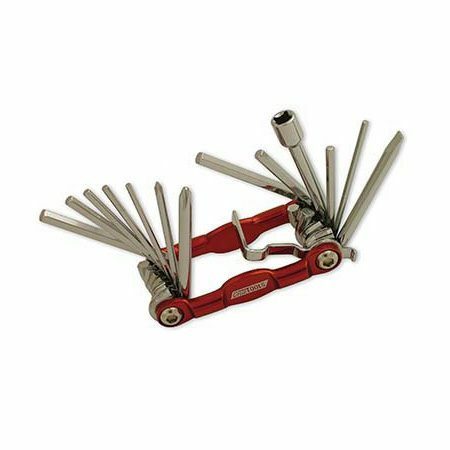 What makes this multi-tool really special is the vast collection of inch and metric hex wrench sizes to handle all of your drumset hardware parts including the pedals! Each tool piece is heat-treated with S2 alloy and has a chrome finish. Top it off with a sleek, red finish and this is the must have gift for any drummer!